A few years ago, an interesting manuscript turned up at auction. Its yellowed pages appeared to contain the life stories of scores of American sailors and Marines who ended their careers (and often their existence) at the Naval Asylum in Philadelphia. 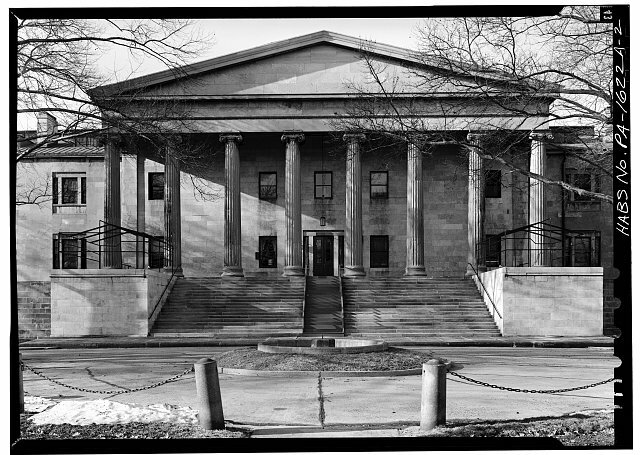 Founded in 1834, the Asylum provided a refuge for men who had worn out their bodies in the service of their country. Between the late 1830s and the early 1850s, some unknown interviewer recorded the histories of many of the inmates. Some are fairly short and sketchy, but others are lengthy and detailed. All of them start out in the third person, but some devolve into the first person- as if the recorder was so entranced by what he heard that he simply copied down the words as they came to his ear. The story of Marine Private Henry B. Joslin is among the most complete and compelling. We almost never hear about the experiences of the common sailor or marine- to have it related in the man’s own words is a rare treat indeed! Henry B. Joslin was born in the Town of Albany in the State of New York in 1779. He is a farmer’s son, and worked one of the farms in Livingston Manor until he was fifteen years old. Came to Philadelphia and enlisted with Captain Edward Miller . went to Pittsburg and remained until the ice broke up in the River. and then went to Cincinnati and was stationed there two years at Fort Washington. General Wilkinson came on and took all the garrison down to Wilkinsonville, it being situated on the Ohio river almost nineteen miles above where it empties into the Mississippi. [We heard] that Aaron Burr was coming in with a large army, but the Conspiracy was broken up before he arrived. General Wilkinson was tried and suspended for three years, and Burr made his way to France - this being November 1810, [my] time having expired I was discharged in the same year and month. Enlisted with Marine Corps under Major Carmack, and was sent on board the Brig Serinac, and made a cruise to Mexico and the West Indies and at Vera Cruz heard of the declaration of war between the United States and England. Sailed as soon as we took in wood, water & provisions. Returned to New Orleans, but was sorely chased by sloop of war “Brazen.” Thirty of our crew gave up saying they were British subjects &for this reason we were compelled to run into Cat Island harbor. Called up all the hunters and sent then on shore to hunt and shoot Beef. They had scarcely landed before we discovered the “Brazen” coming in after us. We recalled the hunters, and got under weigh and stood up about four miles until we grounded in the mud and she anchored in our old berth. We sent word to Colonel Purdy  on shore to send down the Gun-boats with some troops and we would go down to take her = but that night there came on one of those famous West India hurricanes, and compelled us to send down lower yards and top masts, it was a furious gale. All our boats were swept from the davids, and were compelled to hoist our colors Union down . Colonel Purdy sent a boat off and we sent men on shore, collected our boats & brought them on board. The three gun boats we sent for started, but were blown on shore by the gale, and the Brazen was dismasted in sight of us. We sent for a new crew to New Orleans & shortly after, they came with Captain Bainbridge . Cruised all over the Gulph and West Indies, but could not see or hear of an English vessel. We returned as we sailed without orders & remained until we received orders to cruise off awhile, and then make the best of our way into any American Port not blockaded. We stopped off New York, and found it guarded by a blockading squadron. We steered away for Boston and on our arrival ascertained from the fishermen, that the Shannon had captured the Chesapeake and taken her to Halifax , so we ran into Boston, and found the Constitution Comr. Stewart ready for sea…. Stay tuned for the next installment of Private Joslin’s epic War of 1812 adventure, when he joins Constitution’s crew and takes on the Royal Navy! Luckily, the Navy Department Library acquired the manuscript, ensuring these stories will always be available to the public. Captain Miller commanded a company of the Second Sub-Legion under General Anthony Wayne. The Jefferson administration purchased the Louisiana Territory from France in 1803 for $15 million. The Spanish disputed the western border. Not until 1819 did the parties establish the Sabine River as the line between Louisiana and Texas. That is, modern Natchitoches, LA, an important trading post established in 1714.
treason against the United States. Joslin enlisted under Major Daniel Carmick for five years on 17 Dec. 1810. The US Brig Saranac was not launched until 1815. Based on context later in the passage, it seems he served on board USS Syren. HMS Brazen, probably the 18-gun ship sloop launched in 1808. In Barataria Bay, south of New Orleans in the Mississippi River delta. Lt. Colonel Robert Purdy, of the 7th US Regiment. A tremendous hurricane struck southern Louisiana on the afternoon of 19 August 1812. Raising the flag upside down is a universal sign of distress. Joseph Bainbridge, captain of USS Syren. HMS Shannon, commanded by Captain Philip Broke defeated USS Chesapeake, Captain James Lawrence, off Boston on June 1, 1813.